You’ve got to hand it to the Italians, they have it spot on when it comes to food; and they’re usually a step ahead of everyone else. The slow food movement? They never got the memo about eating faster. Locavore? They are so commited to local food, that even after they’ve moved halfway around the world they only eat stuff grown within 50 miles of the house they were born in! 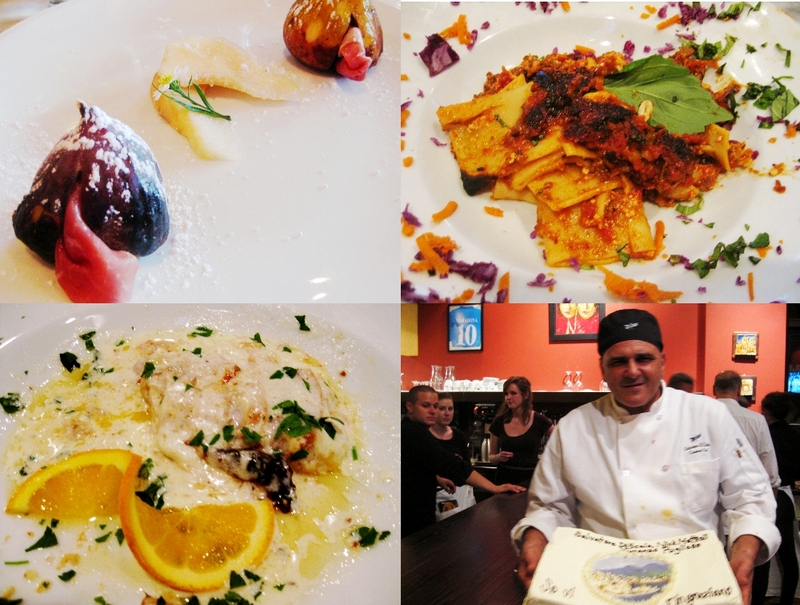 This summer we had the chance to get to know one of the most interesting (and most Italian) chefs around, Salvatore di Scala. Salvatore, a part time resident of Madison (and Tony Soprano’s twin), held a special dinner at his friend Vincenzo’s restaurant, Cafe Porta Alba. Avid readers of the blog (I know you’re out there) will know that Leslie, crazy musical polyglot that she is, occasionally sings Neapolitan music at CPA (with the great Bill and Colleen on mandolin and guitar), and she was asked to sing at this dinner. We were going to be out of town but it sounded so fun we rearranged our schedule a little so we could make it. I’ve reproduced the menu below. I don’t think I need to even say anything. Between the pictures and the menu, you get the idea. And no translation, babelfish it yourself! So, what was my favorite part of the night? I’ll say the Pollo alla Amalfitana (pictured above, lower left) was my favorite dish, indeed it was one of my favorite chicken dishes ever. But it wasn’t my favorite part of the night. I also really enjoyed the old people sneaking out after 3 courses (and 4 hours) when they just couldn’t eat any more. But that wasn’t my favorite part either. We also sat with a lovely couple who were great dinner companions (Ciao R & R!). And Leslie sang, of course, which was a treat for everyone. There was so much to choose from. But my favorite thing about that dinner was how comfortable Sal (and Vincenzo and the CPA crew) made it. It felt just like having dinner with your Italian family. We have been lucky enough to see Sal several times this summer. I’ve noticed that when he’s there, our average stay at CPA is over 6.5 hours. I’ve also noticed that I’m getting used to this and now a 3 hour meal there seems…rushed. Sal, I hope your reading this. You’ve given us a very memorable summer, and we hope it’s not too long till we see you again.